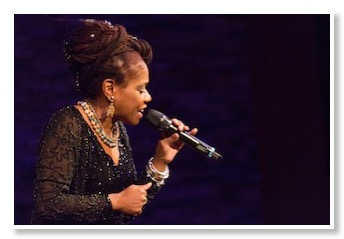 Jazz artist Catherine Russell took the stage dressed in a beautiful black skirt and a jacket embellished with sparkles. As a New York native, Russell was filled with the vibrant energy of her home city, and it showed in her performance. Covers of various songs from the 1920s to the present were included in the set. As Russell sang, her fans swayed to the music, and let out some laughter at some of her more steamy songs. Della Reese's "You Got the Right Key, But the Wrong Keyhole" was a crowd favorite. The song tells the story of a woman who changed her locks, and unfortunately for her ex-lover, his key won't work on her door anymore. Each song was brought to life in a new way with Russell's spin on the classics of artists such as Louis Armstrong and Duke Ellington. Russell's voice carried the songs with verve. The performance ended with Russell's cover of Ethel Waters' iconic song "Harlem on my Mind." Her voice brought new life to the beautiful song, selected as the title track for her recent album. Russell's vitality and flair in her singing seemed to bring enjoyment to all in attendance during her artful performance. Home-grown in Austin, consistently ranked Top 10 in the Austin Chronicle Music Poll, Scorpio Rising did not disappoint at their recent concert at Flamingo Cantina. Serving up their unique blend of industrial EDM dance rock, the dynamic trio consisting of Madame Scorpio (vocals), Wonderbred (guitar), and Armando (drums) kept fans on their toes with favorites such as "Situation Critical," "Brotherly Love," "Millennium Disco," "I Want To Feel its Heartbeat," and "Always Come Back" – which, for a song dealing with the subject of addiction, offers an upbeat dance-perfect tempo. In addition to Madame Scorpio's lively stage moves, each jam featured a popping mix of traditional and synthesized sounds, reminiscent of '80s dance pop with an updated, modern beat. Can't-stay-seated tunes were not the only special component of the show – in true Scorpio fashion, the band directly engaged with their audience throughout the performance. Wonderbred continuously wandered through the crowd and danced with patrons while strumming his guitar, and a dance competition was held during "Get It Up," complete with a glittery scorpion trophy and a pick from the merchandise table for the winner (side note: yours truly took home the prize). The most intimate moment came when Madame Scorpio took the opportunity to share her story of surviving breast cancer with the crowd, encouraging fans to "be aggressive" in safeguarding their health, learning about their bodies, and getting annual checkups. This small act of bravery was not only a much-needed PSA, but a catalyst for bringing the audience and the music closer together. An all-around good energy session for many.